Even with misalignment, some people are still hesitant to address the issue with braces. 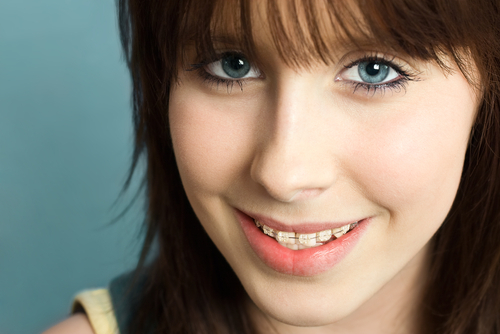 Many worry about the affect wearing metal braces will have on their professional appearance. While Invisalign offers an esthetically pleasing alternative, not everyone qualifies for this option. For the rest, we offer a potential solution with barely noticeable tooth-colored brackets. True or False: Not everyone is a candidate for Invisalign. True or False: Tooth-colored brackets are less noticeable. True or False: Patients report less irritation with ceramic braces. True or False: We will examine your smile to see if you qualify. True. We recommend Invisalign for patients with minor alignment issues who are over the age of 16. For more serious malocclusion, metal brackets and wires are often the best choice to obtain a straighter smile. We will perform a thorough examination of your teeth and jaw to see whether braces or Invisalign best addresses your misalignment. True. Traditionally, the brackets placed on your teeth are made of a very noticeable metal. However, tooth-colored brackets are actually made from ceramic. This material blends with tooth structure while providing the same strength and security as metal orthodontics. True. The ceramic material is gentler on the mouth, with patients reporting a reduction in cheek and gum irritation. Since you maybe be wearing your orthodontics for between a year and a half and two years, comfort is a major deciding factor. True. When you decide you want a straighter smile, we will schedule a consultation. During this visit, we will use digital technology to thoroughly examine your teeth and jaw, including iTero digital impressions, and ConeBeam CT scans. We can then create the custom orthodontics necessary to improve the health and appearance of your smile.